Everyone wants us to go to Mars. And while it makes sense as a scientific endeavor of unparalleled intrigue, it doesn't yet make fiscal cents—no government has given any serious financial backing to any human Mars mission so far. Unlike the Moon, Mars already has all of the resources we need to make it somewhat habitable, as long as we bring along the right equipment. A demonstration of what a Martian habitat might end up looking like... Minus all of the American flags. Image: NASA. Mars has a small atmosphere, plenty of soil, and readily available water just beneath the surface. Settlers will one day be able to draw nitrogen out of the Martian atmosphere, use it to enrich Martian soil, and plant crops that can be watered with Martian water. There are a few other ingredients missing, but the most important stuff is all there—and we won't need to worry about shipping all of our water from Earth. Even better, Mars' smaller gravity well will make return trips back to Earth relatively easy—and we can even manufacture rocket fuel on the Martian surface using readily available water. 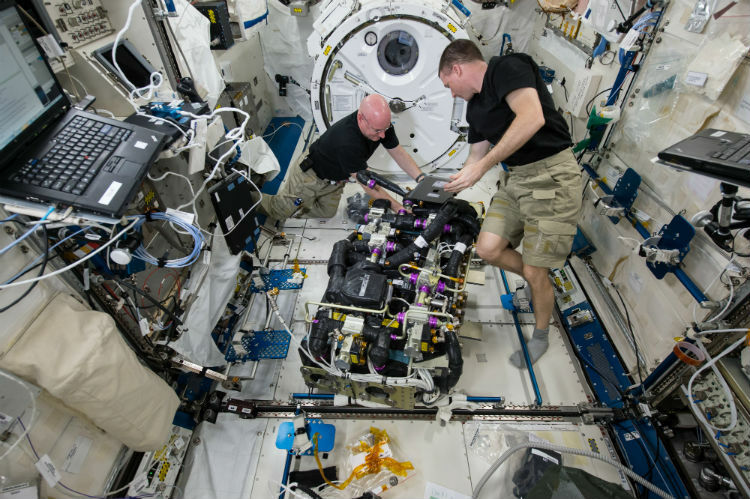 This will enable the easy shipment of valuable samples and people back to Earth. 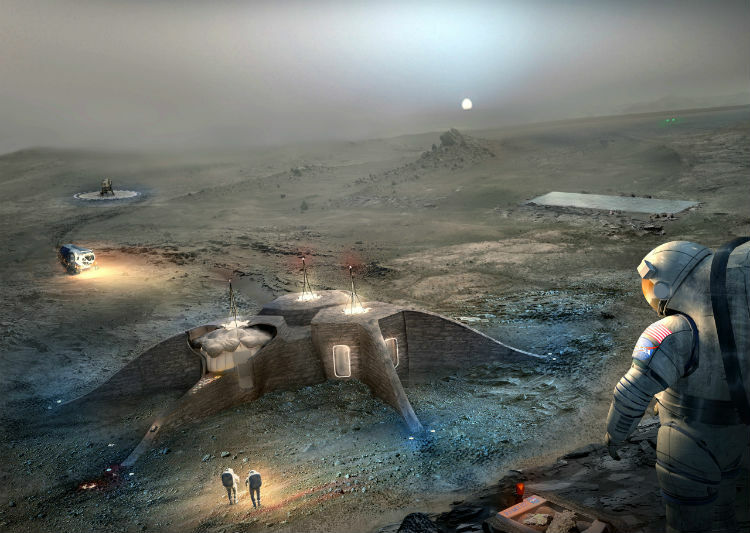 An artist's rendering of a Mars habitat concept design by Team Gamma. Image: NASA. We've learned a lot about maintaining a close habitat through many decades of building space stations, and by all measures it would be far easier to accomplish on Mars. We wouldn't need to worry about micro-meteors and space debris, or going out on complicated space walks to repair the cooling system, or maintaining a specific orbit, or the negative health effects of microgravity. Apart from the distance involved, Mars is just a better place to setup a human outpost than Low-Earth Orbit. To top it all off, a Martian day is just 40 minutes longer than a day on Earth, which will make it easy to adjust to (in comparison to the Moon's 14 days of sunshine followed by 14 days of darkness)—and who wouldn't want an extra 40 minutes to get stuff done, anyways? Mars has everything we need to enable a permanent human outpost to survive and thrive down on the surface. The only problem—and it's the only really big problem—is getting there. Mars isn't an easy place to get to, and it's going to require a lot of effort in order to send a proper crewed mission—ideally one where everyone doesn't die. Funding will need to be increased, but not by some crazy amount. International partners will be a pre-requisite, and the more the better. As things currently stand, no one country has the capability of sending humans to Mars alone, at least not without a ten-fold increase in the space exploration budget. As a study case, the United States was able to get to the Moon by spending what would today amount to hundreds of billions of dollars. When that funding started getting cut back, NASA had a tough time just keeping its space station in orbit. Now, five decades of technological advancement later, NASA could probably go to the Moon with their current budget (around $19.5 billion USD) if they really wanted to. NASA's first attempt at a space station didn't go so well. 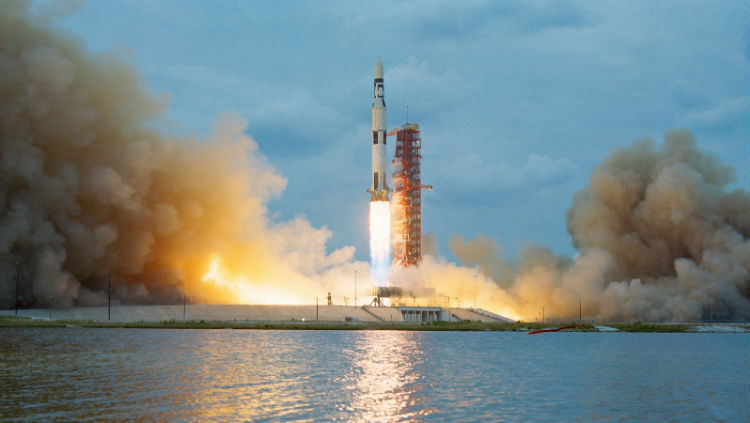 Skylab 1 eventually fell back to Earth when the Space Shuttle wasn't completed in time to boost its orbit. Image: NASA. But getting to Mars today is going to be like getting to the Moon was back in the 1960's. It's not by any means an insurmountable task, but it's definitely going to be a challenge. And capitalism loves a good challenge. A mission to Mars represents a tremendous growth opportunity for the commercial space sector. Just as NASA's commercial resupply program to the International Space Station has allowed the agency to cut costs and increase its pool of available talent (SpaceX is developing a heavy-lift rocket and human space capsule, thanks in no small part to those lucrative NASA contracts). Giving out Mars resupply contracts will open this frontier even further, and could represent an exponential increase in private space sector investment. 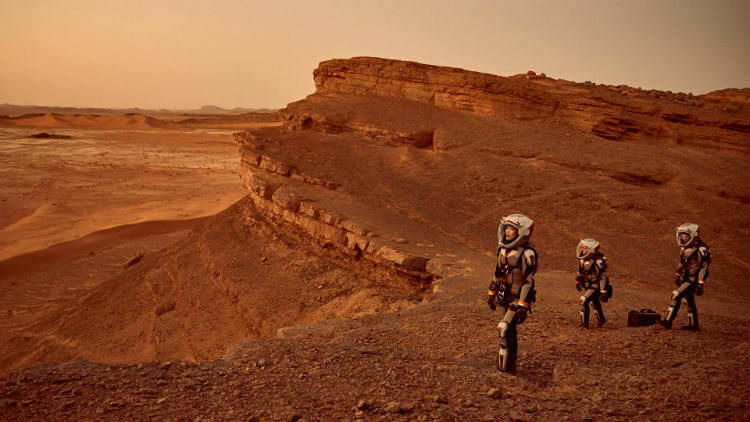 Living on Mars is going to take a lot of human cooperation in cramped habitats. Luckily, they'll have gravity. Image: NASA. Under one potential scheme, NASA could partner with ESA, Roscosmos, JAXA, China, and India, having each entity responsible for one aspect of the Mars mission. Since NASA is soon to have the SLS rocket and Orion capsule available to carry humans in to space, they'll need other partners to build a robust space habitat for the transit to Mars, some sort of landing vehicle capable of descending into the Martian atmosphere, Martian habitat modules for deployment on the surface, some sort of wheeled vehicle to carry humans and equipment, and an array of other optional equipment (such as robotic remote-controlled rovers or drones for scouting, a Mars Ascent Vehicle, energy collection arrays, and so on). 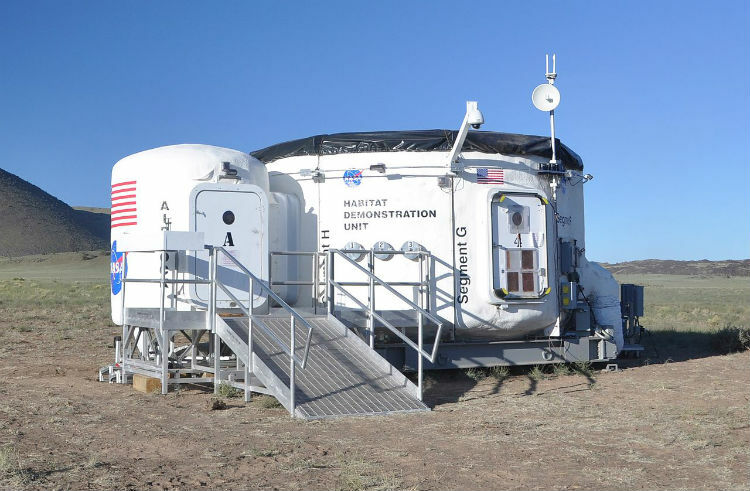 To compliment these core agencies, commercial partners could also be tasked with building their own low-budget versions of the same hardware—inflatable modules for use in space and on the ground (ie. for growing crops), heavy-lift rockets to ship supplies to Mars, some sort of reliable landing mechanism, and so on. 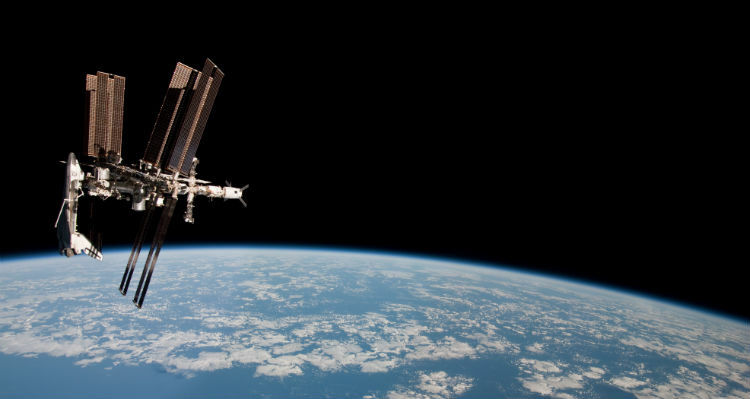 The International Space Station has been an ongoing science project among many nations. Maybe this model of cooperation will be recreated on Mars. Image: NASA. And as we've seen with the space station resupply missions, some of them will fail. But those failures aren't mission-critical because there are several backup options, and several different commercial partners building similar hardware. The same will be the case with a Mars mission: it won't hinge on one space agency getting everything flawless and spending a hell of a lot of money todo it. By utilizing international cooperation as well as private sector space companies, we'll have some built-in redundancy. If one partner drops the ball on any part of the Mars mission architecture, there will be someone else out there to pick it up and carry on. The applications here are numerous, and all of the brainpower and drive in the world is already there, ready to be put to work. We just need a plan for putting it all together. Planetary science is still a very young field. We've learned a lot about how the Earth works in the past few decades, and we've learned a lot about other planets since we started sending out high-tech interplanetary probes, but there are still a lot of unknowns. Of particular interest is how a planetary system makes the shift from being a Goldilocks-like Earth to a hellishly hot Venus, or an arid Mars. Studies have shown that Venus may have been more Earth-like some three billion years ago. And our rovers have found hard evidence that Mars was once host to large oceans. In each case, some phenomena pushed their once moderate climates over the edge. For Mars, it may have been because it was too small for its gravity to hold on to an atmosphere. For Venus, it seems to have held on to far too much of its atmosphere, particularly those toxic volcanic gasses. And here we are, in between these two extremes, attempting to better understand what's happening in our own atmosphere—and, in some (Trumpean) circumstances, failing miserably. Mars isn't known for its diversity. Our pioneers will need to get creative in order to make this place feel like home. Image: National Geographic's MARS. Having humans exploring the surface of Mars will allow us to learn a lot more about the red planet's past and present climate than what our current fleet of robots is able to accomplish. Don't get me wrong, our robots are great—but they're no substitute for human hands and ingenuity. And we won't just need pilots, engineers, and physicsts on a mission to Mars. 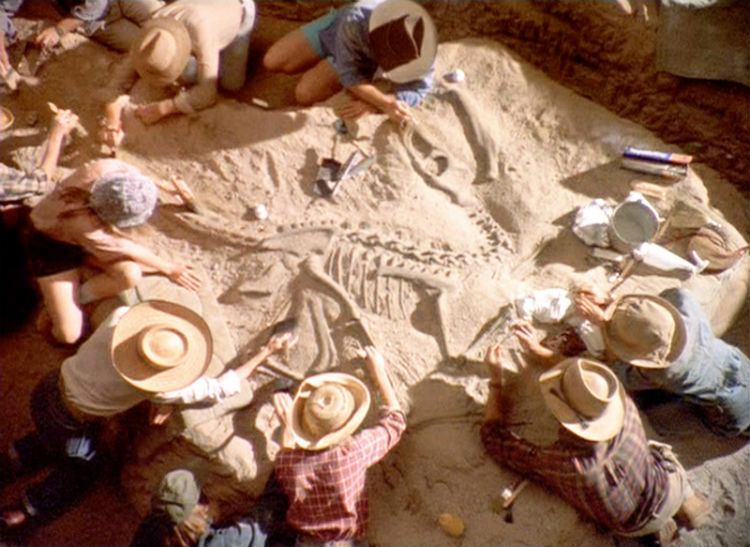 We'll also need geologists, biologists, and paleontologists on the ground as well. We're not just going all the way to Mars to look at some red rocks; we also want to search for past and present signs of life that may currently exist in Martian soil. The next Jurassic Park movie might just be set on Mars. Jurassic Mars: First Contact. Coming soon. Image: Jurassic Park (1993). While there is a significantly increased risk of cross-contamination when humans are involved, the best way to actually find and study Martian life (if any exists or existed) is by putting real humans on the surface of Mars—if we deem such an action to be ethically sound. Besides, how awesome would it be to find Martian dinosaurs? Our current era is wrought with difficulties. On one hand, globally, the lives of those in developing countries is getting steadily better. Less children are dieing young, less people dieing of preventable diseases, and more people are able to get by in the global economy. This trend will probably only continue into the foreseeable future. On the other hand, the political climate is testing. Is this a symptom of a civilization in decline? Image: Gage Skidmore. 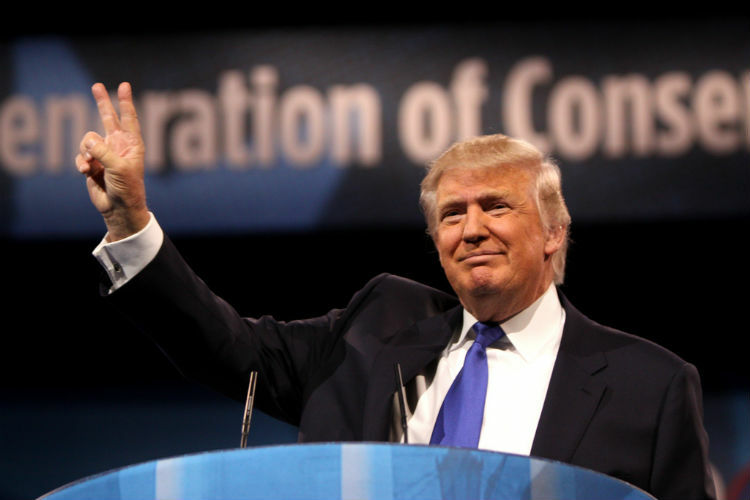 We're once again faced with the rising power of authoritarian governments worldwide. Even the Trump administration can be seen a movement in that general direction. Some critically important treaties are at risk of completely dissolving, and the world is becoming increasingly polarized. The rise of religious extremism is making terrorist acts an increasingly global phenomena that doesn't seem to have any end in sight. The world, as a whole, is becoming more unstable, and our future as a species more uncertain, even as we advance socially and technologically. It may sound cliche, but perhaps having a large, overarching goal like establishing a human outpost on Mars is something we need as a species. Perhaps we need to expand our territory, or accomplish something that seems meaningful, or unlock pathways towards a future that's better for everyone—both on an off Earth. It's amazing how fun Mars looks in all of these artistic portrayals... Image: The Martian (2015). A Martian outpost in and of itself isn't the end game here. The real benefit of such an undertaking would be seen decades or centuries from now, in the form of a self-sustaining Mars colony. The progress we make today towards that future will one day enable us to become a legitimate multi-planetary species—the first of its kind, for all we know. After all, we haven't made contact with any aliens yet, intelligent or otherwise. Maybe the best way to solidify our place in the cosmos and prove to any would-be alien visitors that we deserve to be here is to do something as bold and challenging as establishing ourselves on a second planet.